Before dropping the Saipan Operation and moving on to the amphibious assaults against Guam and Tinian, it is necessary to touch on Vice Admiral Turner's part in the forced detachment of Major General Ralph C. Smith from his command of the 27th Infantry Division, some of the background thereof, and the subsequent furor. The 27th Infantry Division was one of the five infantry divisions in Task Force 56, the Expeditionary Troops. Initially, the 27th had constituted the Floating Reserve for the Saipan assault. Ordered to land on 16 June, the 27th participated in the fighting, commencing 17 June 1944. 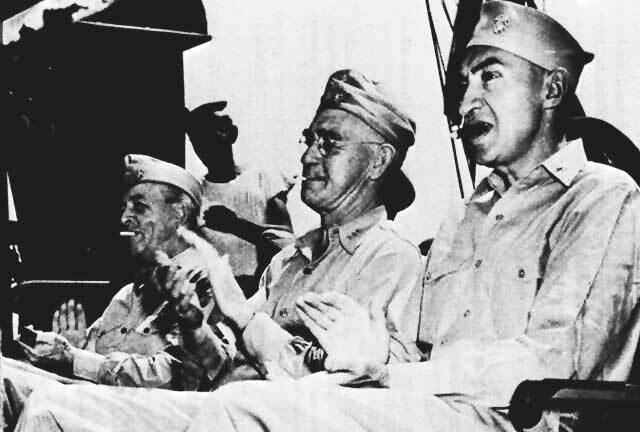 Major General Ralph C. Smith had been aboard the flagship Pennsylvania in November 1943, rubbing elbows with his operational senior, Commander Northern Landing Force (Turner), when General Smith was Commander Northern Landing Troops, and conducting the ground operations at Makin in the Gilbert Islands. Major General H.M. Smith, USMC, also was aboard the Pennsylvania at the same time, being the Corps Commander of the Fifth Amphibious Corps and Commander Expeditionary Troops. Not only at Makin, but during the Eniwetok phase of the Marshall Island operations, units of the 27th Infantry Division had been attached to the Fifth Amphibious Corps and under the operational control and consequent observation of Commander, Fifth Amphibious Corps (H.M. Smith). 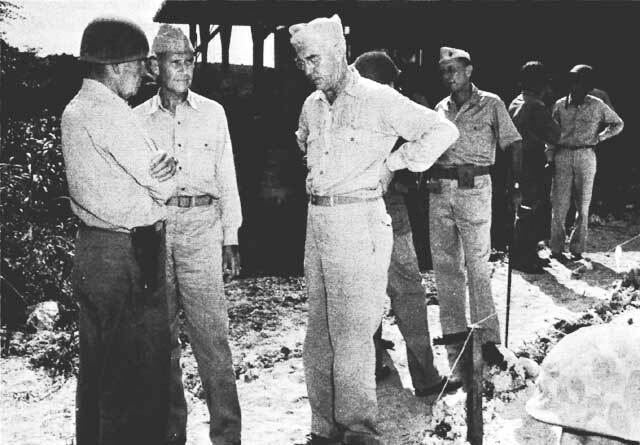 Major General Sanderford Jarman, USA, the prospective Island Commander, Saipan, relieved Major General Ralph C. Smith forthwith. I have a Smith vs Smith file which I will give you. Besides copies of some letters and some clippings it has a half dozen despatches which I thought were important and so kept a copy of them. You may not find them readily available. Admiral Nimitz was very much upset by the incident when it happened and a lot more upset after the war when it was dragged out in the Infantry Journal and The Saturday Evening Post and rehashed all over again. During the War, Admiral Nimitz tried to sweep the matter under the rug in order to keep the controversy from causing any lessening of the 110% cooperation between the Services which he urged at all times, and by and large got. I supported his action then, and still support it. First: Before we went into the Marshalls, 'Nervous Nellie' Richardson (Lieutenant General Robert C. Richardson, Jr., USA) (Commanding General, Army Forces, Central Pacific Area) gave Admiral Nimitz an 'eyes only' memorandum, [for eyes of Admiral Nimitz alone] in which he recommended that the Fifth Amphibious Corps Headquarters [Major General Holland M. Smith, USMC] be limited to administrative duties and that when a future amphibious operation arrived necessitating employment of a corps, that both the Corps Headquarters and the Corps Troops be furnished by the Army. News of that unhappy proposal was soon floating around Pearl Harbor and raising the hackles of every Marine in the Fifth Corps. Second: After Eniwetok, Harry Hill told me that he was far from happy about the performance of the colonel commanding the 106th Regiment of the 27th Division that had fought there. I had had a few unhappy thoughts of my own about that part of the 27th Division which was at Makin. But I told Harry Hill we would just have to learn how the Army fought and support them as best we could. You will also note, if you read the record carefully, that Colonel Ayers [Russell G.] who commanded the 106th Infantry Regiment at Eniwetok Atoll and again on landing at Saipan was relieved of his command after a couple of days by the Army General [Jarman] who stepped into Ralph Smith's shoes. One thing I would like to have appear in the record is that when a draft of the Army's history of the Marianas Campaign was made available to me and I read carefully that part of it dealing with the 27th Infantry Division's fighting on the 22nd and 23rd of June, and the chapter on Smith versus Smith, I was very much pleased to find the former quite factual and temperate. Without saying that I agreed with every word in every sentence, I thought the account of the troubles of the 27th Division which led to Ralph Smith's relief well balanced. didn't know Ray Spruance and didn't know what really happened would say or write that. That's . . . a lie. I was invited on many occasions after the war to express opinions for publication in regard to this 'Smith versus Smith' matter. I avoided them like the plague. That's still my policy. a. The responsibilities assigned to the headquarters of the Fifth Amphibious Corps be restricted to administrative duties in connection with USMC troops in the Central Pacific Area. One could infer from this that Fleet Admiral Nimitz believed that Lieutenant General Richardson was more influenced by old friendships than by the facts, when acting in this controversy. undertaking battle with our protective air cover. 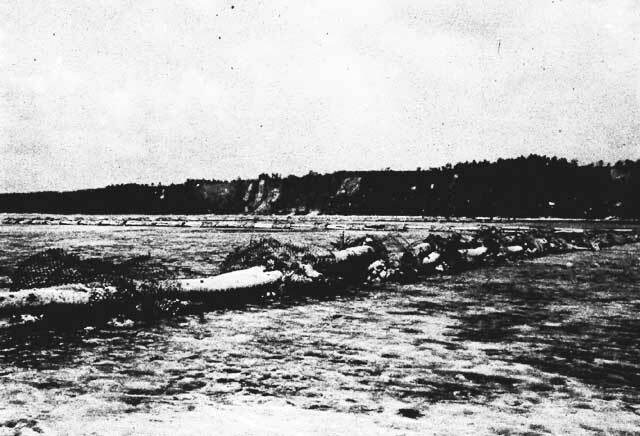 Knowing how temporary putting an airstrip " out of commission" had proven to be, and how fast the Japanese Soldier was with a shovel, it seemed most desirable not to permit the Japanese to use the airstrips on Saipan, even intermittently, to interfere with the large task force essential to recapture Guam. Vice Admiral Turner spent only three days at Guam during the twenty days of the assault landing operation required for the reconquest. While these were the vital first three days, it is obvious that he left the amphibious operation largely to Commander Southern Attack Force (TF 53), Rear Admiral Conolly, in whom he had great confidence. So only the planning aspects pertaining to the exact day when the assault would be launched, in which Vice Admiral Turner participated, and the general features of the assault landing will be covered. Most of the detailed planning for the landing operations of the amphibious assault on Guam was done at Guadalcanal in the Solomon Islands by Rear Admiral R. L. Conolly, Commander Group Three, Fifth Amphibious Force, and by Major General Roy S. Geiger, USMC, Commanding General, Third Amphibious Corps. The Marine Third Division commanded by Major General Alan Turnage, USMC, and the First Provisional Brigade commanded by Brigadier General Lemuel C. Shepherd, USMC, both assigned to the Guam operation, and making up the Third Amphibious Corps, were on Guadalcanal. The assigned attack transports and lesser amphibious craft were at Hollandia, a thousand miles to the westward where they were working for General MacArthur until the last of April, and the majority did not arrive back in the Solomons until about 10 May 1944. This was only three weeks before the sailing dates for Task Force 53 necessarily occurring between the I st and 4th of June. The Appalachian (AGC-1), the only amphibious command ship other than the Rocky Mount currently available in the Pacific, flew Rear Admiral Conolly's flag after her arrival in the area from Pearl Harbor on 27 April 1944. Esperance area of Guadalcanal. After its departure, the task force staged through Kwajalein and Roi in the Marshalls enroute to Guam. Beginning about 16 June 1944, it was obvious that the Guam assault could not be launched until the Japanese Fleet was beaten off and was out of the Philippine Sea. It was ten days after the initial Saipan landings before the Japanese Fleet had exhausted itself, was in retreat, and the continuance of the FORAGER Operation seemed secure. Until about this same date, 25 June, the doughty Japanese on Saipan had put up such a dogged and, in many ways, skillful defense that both Commander Expeditionary Force and Commander Expeditionary Troops easily agreed that there was a real chance that some of the assault troops for Guam might have to be used on Saipan. 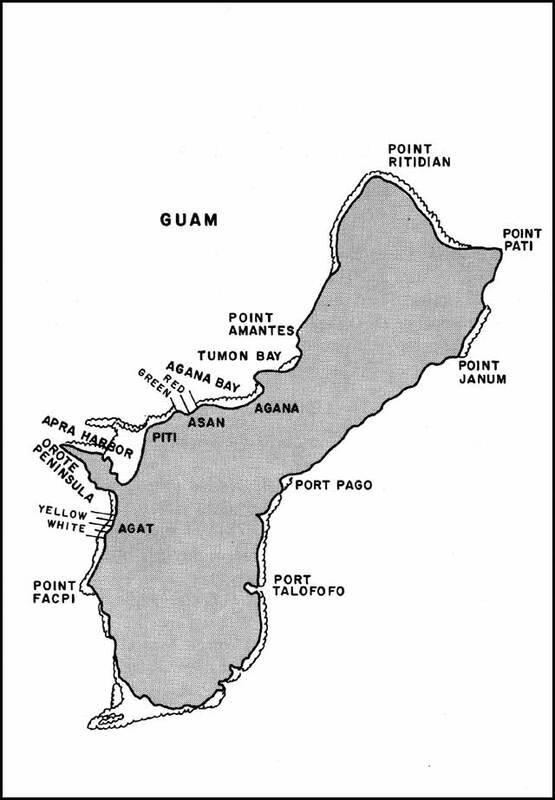 So the assault troops for Guam remained afloat and within supporting distance of Saipan. After the Commander Expeditionary Troops was willing to release part of the Guam assault troops from standby duty at Saipan, Commander Fifth Fleet and his more senior Expeditionary Force officers, conditioned by the rugged Japanese defense on Saipan, decided to wait to launch the assault on Guam until the 77th Infantry Division arrived in the Marianas so as to have a higher ratio of assault troops to Japanese defenders. This decision was reached despite an expressed desire and willingness of Rear Admiral Conolly and Major General Geiger to make the assault prior to this date. On 25 June, the Northern Attack Group for Guam (TG 53.1) with the Marine Third Division embarked was told off to return to Eniwetok. The Southern Attack Group for Guam (TG 53.2) with the 1st Provisional Brigade embarked remained off Saipan as a Floating Reserve for another week. On 3 July 1944, Admiral Spruance held a conference of his senior subordinates to try to determine a realistic date for the assault landing on Guam. The date chosen was 25 July. Hawaii could not possibly arrive at Guam before that day. Actually, they arrived on 22 July. The month-long delay in launching the assault held the possibility of creating a number of problems for the amphibians. One of the more worrisome was that July was the month when typhoons were something more than a possibility in the area of the Marianas. Another worry was how well the newly put together crews of the smaller amphibious ships and the on-edge Marines crowded aboard them, would stand up under the long continued suspense and the monotony. Vice Admiral Turner reported that 37,292 Marines and 19,245 Army troops participated in the assault on Guam. This was about 80 percent as large as the assault force on Saipan. With over 56,000 troops, our assault forces at Guam outnumbered the 18,500 Japanese troops by just better than a 3-to-1 ratio, while on Saipan the ratio had been only somewhat better than 21/2-to-1. Consequently, the Guam operation proceeded more rapidly although the island was three times as large as Saipan. Guam was captured in 20 days versus 24 days for Saipan. While the records indicate that there were an adequate number of Marines assigned to the Guam assault, the War Diary of the LST-227, underway since 31 May 1944, reveals an unplanned strengthening of the assault troops on 12 June. As indicated before, the Japanese actually had double the number of the top figure of this intelligence estimate of troops, that is, about 18,500. Besides 18,500 troops, the Japanese on Guam had the benefit of the presence of Lieutenant General Hideyoshi Obata, Commanding General, 31st Army, as well as Lieutenant General Takeshi Takashima, who was Commanding General, 29th Division, the basic infantry unit assigned to the Guam defense. Lieutenant General Obata who, as previously mentioned, commanded all Japanese Army defense forces in the mandated islands and in the Bonins, had flown back to the Marianas from the Palau Islands after the assault on Saipan had started. Unable to alight on Saipan, he chose Guam and died there. The Japanese defensive armament on Guam was not massive, but there were 19 Japanese 20cm (8.0"), eight 15cm (5.9") and twenty-two 12.7cm (4.9") coast defense guns and approximately 40 heavy and 96 medium anti-aircraft guns to worry the invaders. Ten days before the assault landings in Guam, a Saratoga shipmate of Vice Admiral Turner's, Chief Radioman George R. Tweed, was picked up from a Guam hideout by a destroyer, the McCall (DD-400),15 carrying out a shore bombardment mission. Tweed and four others had ridden away from Agana as the Japanese came into the town in December 1941 and all hid in the bush country. The others were captured and killed but Tweed had survived on Guam all during the Japanese occupation. Vice Admiral Turner sent Tweed a warm welcome message. All of northern Guam is a high plateau, while southern Guam is rough terrain with numerous low mountain peaks. Guam's shore line has a few good-sized coral beaches and many miles of high cliffs. In addition to the bedrock choice of adequate landing beaches, consideration also had to be given to the barrier reef from 25 yards to 700 yards wide surrounding the greater part of the island. This barrier reef existed off shore from all the good landing beaches, including those chosen. The beaches selected--Asan to the north of Apra Harbor, and Agat across Orote Peninsula to the south from Apra Harbor--were the best. But the Japanese naturally put in their heaviest fixed defenses and grouped their troops to protect them against an assault. The main Japanese defense line ran from Point Amantes marking the north of Tumon Bay south to Point Facpi on the west coast of Guam. For the amphibians, the worst part of the Guam assault was the waiting for it. Having staged through Kwajalein and Roi between 9 and 12 June, Task Force 53, except for the bombardment groups, just circulated in the hot sun for the next two to three weeks, while the Japanese Fleet was being defeated in the Philippine Sea and while the battle for Saipan was being won. This trip which ended up in Eniwetok instead of Guam was probably one of the longest endurance runs of a Tractor Group (LSTs) with troops aboard and otherwise combat loaded and without replenishment of supplies and fresh water, on record. During the 26-day period at sea (9 June to 5 July) material breakdowns, although numerous, for the most part, were minor and of short duration. . . .
LST-278 noted in her War Diary that she had 456 personnel on board when sailing from Eniwetok. One hundred seventeen were in the ship's company. To make her particularly unhappy when enemy planes were around, she also had 100 drums of gasoline and 70 tons of assault ammunition, mostly stowed topside. A fourth plane circled to the rear of the formation and came in low at about fifty feet bearing about 175° relative to the [LST] 227. All the guns that could bear opened at about 4000 yards. Wisps of smoke appeared when about 2000 yards distant on its wing and engine cowling. The plane then turned, all our guns still firing with hits observed, and flew toward the starboard quarter of the LST formation and fell into the sea with an increase of smoke and flames appearing. . . . Other LSTs were firing as well, so that a dispute no doubt would develop as to who got the plane. 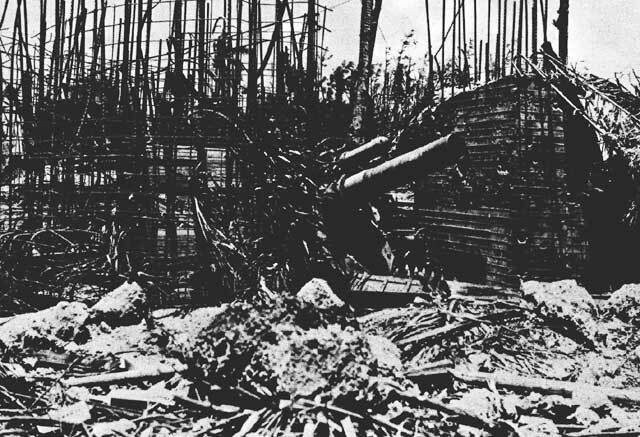 The month-long air and gun bombardments against Guam by and large were concentrated on the primary Japanese defense zone on the western side of the island between Tumon Bay and Point Facpi. There could be no doubt by the Japanese defenders, as to the general area of our assault landing. This was particularly so because, in addition to the bombardments, the underwater demolition teams for days conducted gunfire-protected demolition operations to clear the chosen beaches of natural and artificial obstacles to our landing craft. Preliminary gun bombardments of Guam were carried out on 16, 27, and 30 June. Beginning 8 July 1944, Guam received daily heavy air and gun bombardments steadily increasing as additional air or gun bombardment units arrived from the Saipan area. Rear Admiral Conolly arrived at Guam on 14 July and for the week prior to the landing personally coordinated the air and gun bombardment, and supervised the clearing of the beaches. At the time of FORAGER the Underwater Demolition Teams work was divided into two phases. Phase I was the reconnaissance of the approaches to a beach and the removal, insofar as practical, of all obstacles in the approaches. Phase II was the post-assault work of blasting channels and constructing ramps to the beaches. Prior to Saipan, the UDTs had been reorganized, expanded and well trained for their dangerous but essential chores. They effectively explored the ever present barrier reefs guarding each landing beach in FORAGER and removed obstacles. 1945: Started approach for night operations to remove antiboat obstacles on landing beaches at Asan. Orders were to remove obstacles close to shore first. Operation delayed due to grounding of LCI-348 on reef. After attempts to remove LCI, which was taken under heavy mortar fire by enemy, it was decided to abandon it and crew was removed by UDT #3's, Boat No. 4. 0100: Delayed operations to remove obstacles started. Platoons 1 and 3 failed to locate obstacles assigned them. Platoons 2 and 4 removed 60 obstacles each from Blue, Red 2 and Green Beaches. Mortar fire from DDs. Result 120 obstacles removed; used 2400 pounds Tetrytol. 1400: 3 LCPRs sent to reef edge under heavy fire cover and smoke screen, and launched 5 rubber boats. 150 obstacles removed, using 3000 pounds Tetrytol. The edge of the reef, contrary to what was indicated by aerial reconnaissance, did not break off sharply, but had a gradual slope from 18" of water at edge of reef to about 6' of water, 100 feet from edge of reef. . . . The enemy had placed obstacles in an almost continuous front along the reef. These obstacles were piles of coral rock inside a wire frame made of heavy wire net. . . . They were 3 to 5 feet in diameter, 3 to 4 feet high and 5 to 8 feet apart. . . .
21 July 1944. 0730: Dispatched all UDT Boats to respective beaches to guide LCM's and LCTs with tanks ashore and over reef. William Day, the day for the assault landings on Guam, was 21 July 1944. How Hour, the time the first assault wave was to hit the beach, was 0830. 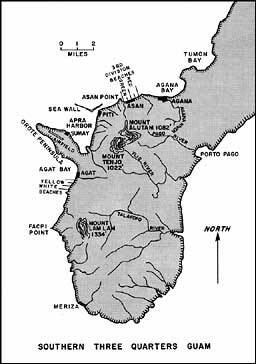 The objectives were along an eight-mile stretch of the coast in the vicinity of Apra Harbor which included the series of four villages of Asan, Piti, Sumay and Agat. 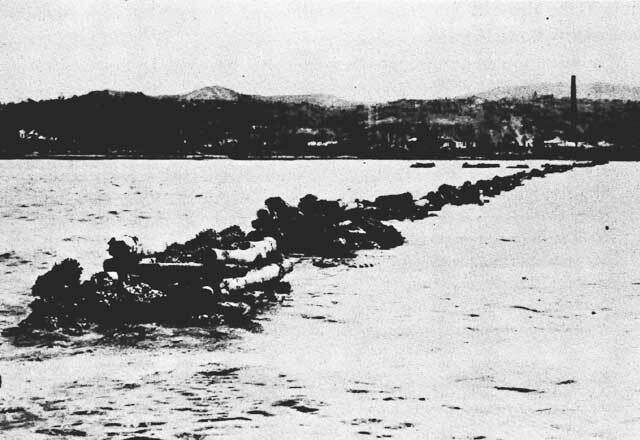 The Third Marine Division landed at Asan north of Apra Harbor. The 1st Provisional Marine Brigade landed at the Agat beaches south of Orote Peninsula and three miles south of Apra Harbor. All assault waves were in amtracs. The lead waves hit the beach on schedule. The initial assault waves on the southern beaches at Agat received light mortar fire. As the third and fourth waves landed at the northern Asan beaches, enemy mortar fire commenced on the reef and beach areas. As soon as the troops were out of the amtracs at both beaches, the amtracs were used to shuttle to the beaches logistic support brought to the outer edge of the fringing reef by LCVPs since ordinary landing craft could not cross the shallow reefs. LCTs soon augmented the LCVPs and LVTs. Once ashore both assaults were met by the usual stubborn to fanatical Japanese defense. After a short period of fitting out, she proceeded to Chesapeake Bay for shakedown and training and then to the Norfolk Navy Yard, Portsmouth, Va., for post-shakedown availability. She then . . . proceeded to Pearl Harbor, reporting for duty to the Commander in Chief, Pacific Fleet, on May 19, 1944. The ship was first assigned as an Amphibious Training Ship at San Diego, but just before she reached the West Coast, she received orders to replenish fuel and provisions and return to Pearl Harbor at best speed. Upon her arrival at Pearl Harbor, the Alshain was assigned to temporary Transport Division 38 (Captain J.B. Heffernan, USN, in USS Lamar, APA-47) and commenced loading combat cargo of the 305th Regimental Combat Team of the 77th Infantry Division for the forthcoming invasion of Guam. The Alpine (APA-92), another ship in the division, was not even commissioned until 22 April 1944. Nine weeks later she also was loading troops for Guam. It was a minor miracle, in addition to indicating the soundness of the basic amphibious manuals, that the ships of this division turned in such satisfactory performances. Rubber boats and DUKWs had to be used for this unloading since no LVTs were available to the ships landing the 77th until William plus seven. Two XAKs in the hodgepodge of ships used to ferry the 77th Infantry Division to Guam did not even carry landing boats. Generally speaking all cargo, except wheeled vehicles, had to be manhandled, towed, floated, pushed, paddled or carried in amphibious vehicles (when available) over 500 to 700 yards of reef to the beach. . . .
Japanese counterattacks during the first week of the Guam assault were strong. During one on the Asan beaches as late as 26 July, infiltrators reportedly reached the beach area. Guam had been reached, and by 9 August, Point Ritidian at the northern end of the island was taken. Beginning on 10 July, until after the first assault waves had beached on 21 July, the Japanese on Guam fired neither coast defense guns nor anti-aircraft guns. This permitted our air bombardment to be conducted far more accurately, but it also led to a false sense of security by the smaller amphibious ships. After the first two shots which bracketed the LST-227, the enemy gunfire was directed at the LST-481 on our starboard quarter. Numerous hits were observed. The LSTs 227 and 481 immediately made smoke and got underway dragging anchor. The LST-481 burning forward of the superstructure deck passed close aboard and cut in front of the bow of the LST-227. . . .
1. There were no natural passages through the fringing reef for use by landing boats. 2. The barrier reef was far distant from the beach (200 to 500 yards). 3. The water over the barrier reef at Agat was too deep for trucks to be launched there from landing craft and then keep moving to the beach under their own power, even at low tide. 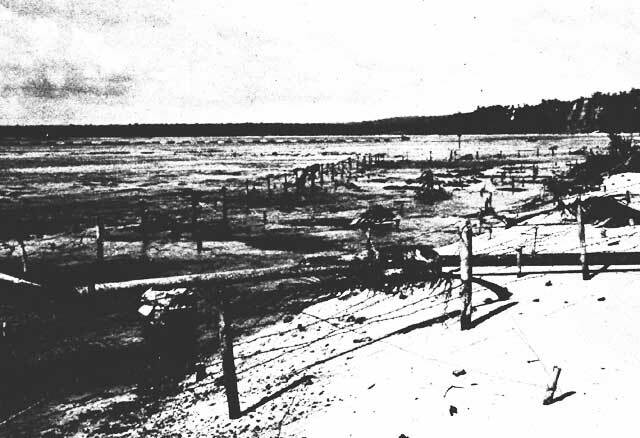 Dadi Beach, located between Agat Beach and Orote Peninsula, was used for unloading after Orote Peninsula was well in hand (28 July 1944), and the danger from a flank assault removed. Organized Japanese resistance was declared ended on Guam on 10 August 1944. Vice Admiral Turner returned to Guam on 13 August, by which date Rear Admiral Conolly had been relieved by Rear Admiral Reifsnider and departed for his chores at Yap and Ulithi in the Palau operation. At noon on 15 August, two months after arriving at Saipan to initiate the assault landings of FORAGER, Vice Admiral Turner in the Rocky Mount got underway for Pearl Harbor, arriving there on 26 August 1944. In the next month after Vice Admiral Turner's departure from Guam, nearly 5,000 Japanese were rooted out of canyons and caves. A few in scarce incidents surrendered, but mostly they fought to the bitter end. Between 15 September and 15 November 1944, the enemy still refusing to yield to fervent pleas to surrender in the face of greatly superior force, another 1,600 Japanese committed suicide or had to be killed. Throughout the assault period and during the cleanup action, the gunboat LCIs rendered yeoman service, not only shooting into caves and other hiding places, but ferrying Marines from here to there as they sought out the remainder Japanese. During this period, 29 July through 4 August 1944, heavy weather made unloading very difficult and at times brought it virtually to a standstill. The capture of the island of Guam has ended the naval gunfire requirements of the Landing Force. I wish to express to you, your fire support unit commanders, and the firing ships themselves my appreciation for continuous and effective support rendered. The enemy was never able to rally from the initial bombardment and the continual gunfire support kept him in a state of confusion to the end of the campaign. Naval gunfire contributed largely in keeping losses of the Landing Forces to a minimum and in bringing the Guam Campaign to an early and successful close. It is believed that this campaign has set a new mark for the employment of the fire power of our ships and it is hoped that in future operations of this force, naval gunfire may do as much for us. Two personal letters from Vice Admiral Turner during FORAGER touched on naval gunfire support. The first referred particularly to Saipan and the second to FORAGER as a whole. Not a single piece of enemy artillery was brought to bear on the transports, or the first of the assault waves. Fighter aircraft armed with rockets took over much of the bombing previously allocated to dive bombers. (SB2Cs). The Underwater Demolition Teams, aided by heavy protective fire, were able to undertake three days and three nights of large scale demolition of natural and artificial obstacles. In this connection Commander Southern Attack Force reported: "Landings could not have been made on either north or south beaches nor any other suitable beaches without these elaborate but successfully prosecuted clearance operations." The air bombardment was the heaviest of the war because all four of the fast carrier task groups as well as twenty four jeep carriers were available to conduct it in the days immediately before and after the assault landings. The logistic support landed during the first four days of the assault averaged 10,000 tons. The amphibians were not pestered with Japanese air, submarine, or surface fleet attacks which was another reason all went well within Task Force 53. Operation was brilliantly and valorously conducted and resulted in the recovery of important American Territory and the Liberation of a loyal people. Well Done. preceded the drafting of the final plans for the assault. The professional argument concerned which beaches should be used. Both the early and final plans called for a 'shore to shore' amphibious movement in part, rather than a simon pure 'ship to shore' amphibious movement, since the two Marine Divisions who would conduct the assault landing were those that had fought on Saipan and were on Saipan. This meant that somewhat more than one division was to be out-lifted from Saipan directly to Tinian in LCIs, in landing boats, or in amtracs and DUKWs carried aboard LSTs and LCTs. Vice Admiral Turner set the style in utilizing the great competence of available subordinates. Rear Admiral Harry W. Hill was handed the ball for Tinian and told to run with it. This, as Commander Northern Attack Force and Commander Task Force 52, he did to the satisfaction of Vice Admiral Turner. Not to be outdone, Lieutenant General H.M. Smith, USMC, in due time, passed command of the Northern Troops and Landing Force to Major General Harry Schmidt, USMC, who had commanded the Fourth Marine Division during the capture of Saipan. Major General Clifton B. Cates was assigned to command the Fourth Division and the Second Marine Division continued under the command of Major General Thomas E. Watson. The naval forces participating in the Tinian assault, by and large, were those that had assaulted Saipan, except for the large attack transports and attack cargo ships which had left the Marianas and returned at best speed to Pearl Harbor to embark the 77th Infantry Division and their impedimenta for the delayed Guam assault. Rear Admiral Hill recalls that he received advance notice of his new chore on 2 July 1944, and despatch orders on 5 July.38 On 6 July, Commander Saipan Island relieved Rear Admiral Hill of the task of unloading all ships off Saipan, thus relieving him of one of his major tasks, which had kept him busy as a cat on a hot tin roof since 15 June. As an indication of how the Tinian assault was completely in the hands of Rear Admiral Hill, it is noted here that Vice Admiral Turner was at Guam in the Rocky Mount when the Tinian assault was actually launched. He had left Saipan in time to join Rear Admiral Conolly in the Northern Transport Area for the assault landing on Guam on 21 July 1944. He stayed at Guam until after the first assault landing had been made on Tinian on 24 July, arriving back at Saipan the next day. The Headquarters of the Japanese First Air Fleet was on Tinian and its commander, Vice Admiral Kakuji Kakuda, was among those on the island when we landed on 24 July 1944. He had tried on several successive nights to keep a rendezvous with a rescue submarine but his rubber boat never located the submarine. Colonel Kiyochi Ogato commanded the Japanese Army's 50th Regiment. Captain Goichi Oya, IJN, commanded the Japanese Navy's 56th Guard Force. These two backbone units of the 9,000-man Tinian Defense Force were about equally matched in personnel strength. Colonel Ogata was the overall commander. The 56th Naval Guard Force manned the three 6-inch coast defense guns of British manufacture, as well as the ten 14-centimeter (5.5") coast defense guns, the ten 12-centimeter (4.6") dual-purpose guns and the four 76-millimeter (3.0") dual-purpose guns collectively protecting the island from sea or air assault. town. This stilting was unfortunate from an amphibious assault point of view, since the cliffs were roughly from ten to one hundred feet high. In general, the east coast of Tinian was more rugged than the west coast. 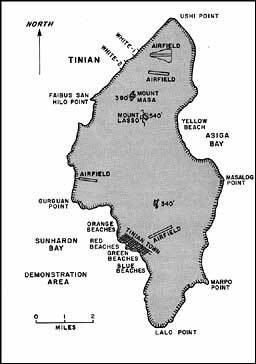 There were only three possible landing areas on Tinian: Sunharon Bay on the southwest coast, Asiga Bay on the east central coast, and the White Beach area in northwest Tinian. White Beach One and White Beach Two in northwest Tinian were about 1000 yards apart. In Sunharon Bay there were four landing areas which had been designated for planning purposes: Orange, Red, Green, and Blue. Red and Green each had two beaches. Blue Beach, a mile south of the piers in Tinian Town, was 600 yards long. Green Beach One, in the center of Tinian Town and between the only two piers, was 600 yards long. Green Beach Two at the southern end of Tinian Town was 400 yards long. Red Beach One and Red Beach Two north of the piers totaled 825 yards. Orange Beach was half a mile north of Red Beach One and 340 yards long. In Asiga Bay Yellow Beach One was 355 yards long and Yellow Beach Two, 200 yards long. Cliffs flanked both the Yellow beaches and heavy surf pounded them whenever the wind was from the east. The northeast trades were prevailing in July 1944. All four of the beaches in Sunharon Bay had something to recommend them even though the two best ones and the closest to Tinian Town piers were something less than excellent. This captured order was only one of the intelligence nuggets dug out of documents extensive enough to fill 75 mail bags and 54 crates which were garnered during the Saipan operation. That the Japanese expected our assault to touch down at Tinian Town or just possibly at Asiga Bay was a good reason for not making it at either of these locations. But the alternatives were something less than an amphibians dream beach. White Beach One was almost directly west of the main runway of Ushi Point airfield and about six miles due north of Tinian Town. The fringing reef was of dead coral about 75 yards wide. At the seaward end of the reef the water was 31/2 feet deep at high tide. The reef bared itself at low tide. White Beach One was only 65 to 75 yards long and 15 to 20 yards deep. But the relatively smooth off-lying reef shelf was about 300 yards long and it was believed that LVTs and LCVPs could land troops right on this reef shelf and they could wade ashore to the small smooth sand beach area. There was a narrow, rough road leading from the southern end of White Beach One toward the Ushi point airfield. However, movement up and out the exits from the beach to the plateau on which the airfield had been built was generally difficult due to boulders, a steep rise, and heavy brush. There were some horned mines off the beach, but it was discovered that these were largely inoperative. The beach is 15-17 yards in width, 200 yards long, and sandy and smooth except for a few scattered rocks. . . . On the left northern part is a ledge of dead coral about 21/2 feet high, which could be easily taken out by a bulldozer tank or tetrytol charges. It is believed that with the aid of demolition and a bulldozer tank, 200 yards of beach can be made available for a landing. . . .
White Beach Two had two rows of mines offshore and box mines covered the exits. The two big advantages for the northwest beaches which everyone immediately recognized were that they were within range of direct artillery support from Saipan, and that they were on the lea side of Tinian. The tremendous disadvantages, which were weighed differently by each commander, were their extremely small frontage and their narrow steep exits. Previous experience had been that a division commander with troops to land generally started looking for a beach a mile or more long with many exits. He started getting unhappy if there were only 1,000 yards of beach and two good exits, and was really jumping up and down if the beach area narrowed below 500 yards and had only one good exit. The next day I went to Turner to give him this data and to outline our views in regard to using the White beaches. To my consternation and dismay, he was adamantly opposed to even thinking of the White beaches, and gave me positive orders to stop all planning for such a landing. It was a very explosive conference and placed me in a most embarrassing situation. In vain I tried to convince him that, pending report of reconnaissance, we should explore the possibilities of those beaches along with the others. I returned to the Cambria in a state of perplexity. Here I was, charged with the sole responsibility of planning, but ordered to prepare a plan that neither I nor Harry Schmidt liked. I could fully appreciate Turner' s fear of trying to use these little handkerchief sized beaches, but realized that we had considered all angles of the problems much more fully than he had. Yet he was a man of such proven wisdom and Judgment that it created many doubts in my mind as to the correctness of my thinking. On the long boat ride back to the Cambria I came to the conclusion that despite his decision, we should explore further the feasibility of the White Beach plan. So I split my staff into two groups, one to work on the White Beach plan, and one to develop the Tinian Town plan--with a view to delaying the final decision. One of the controlling factors to be considered in the planning was how great the logistic support build-up for the Landing Force had to be, and that depended on how quickly the island could be captured. Major General Schmidt estimated eight days would be required. On the nights of 10-11 July and 11-12 July 1944, personnel from the Underwater Demolition Teams and from the Marine Reconnaissance Battalion took a "look-see" at the White and Yellow Beaches. Of the west coast beaches, only White Beach One was examined the first night, because the reconnaissance teams did not touch down on White Beach Two, having been swept north of it by the strong inshore current. The report on White Beach One and its approaches was favorable. The next night (11-12 July) the reconnaissance teams returned to their chores and this night made a close examination of White Beach Two. This beach was poor but usable. The reconnaissance personnel thought that fissures along the outer edge of the underwater reef shelf might be a hazard to amtracs at low tide. A quite real shore-side hazard was a string of land mines flanking the desired landing area. With this information at hand and digested, Rear Admiral Hill returned to the Rocky Mount, hoping to receive a "go ahead" signal from the big boss. He had no such luck. He simply would not listen, and again ordered me in very positive terms to stop all White Beach planning and to issue my plan for the Tinian Town landing, which had already been prepared. Instead of returning to Cambria, I went ashore and explained the situation to Holland Smith, who had always been in favor of the White beaches if we could make a workable plan. Then I went to see Spruance. To him I outlined my plan, its many advantages over any other landing point, and told him of my two discussions with Turner. Spruance liked the boldness and surprise element of the plan as outlined. He said he would call a conference--I think for the same afternoon--to settle the matter. land on the narrow and very poor beaches (relatively undefended) near the north end of Tinian. The latter beaches could be dominated by our ready placed artillery on the south coast of Saipan, and we were convinced we could negotiate the beaches as a result of our UDT and beach reconnaissance. But Admiral Turner would not give in. I think Admiral Turner was very concerned over the logistic support phases of the operation, and as soon as the very special arrangements which we had made had been detailed to him, he became convinced of the practicability of using the White Beaches and approved. In any case there were twelve days between the taking of the final decision as to beaches and the actual assault, and this allowed ten days of full speed ahead preparation. 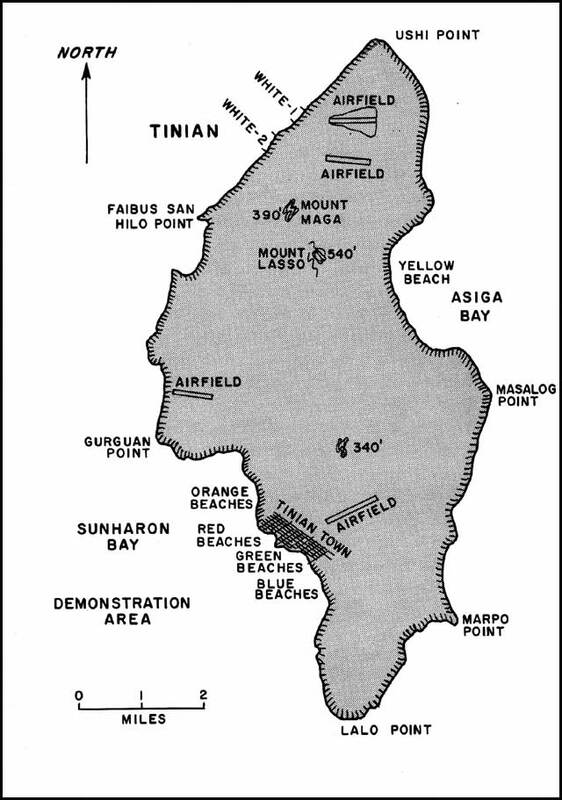 On 12 July Rear Admiral Hill was directed to assume command of the Tinian53 Attack Force (TF 52) and to capture, occupy, and defend Tinian. Physical loading was accomplished with a minimum of difficulty, the beaches and harbor facilities at Saipan proving adequate to handle the loading. To permit bombardment ships to do their work close to shore, the minesweepers swept to within five hundred yards and found no mines on the west coast of Tinian. They did their sweeping off Tinian Town on the day before the assault (Jig Day) in order to foster the impression that the Marines were going to land there soon. The mineable waters off the White Beaches were limited and these were not swept until Jig Day, beginning at 0600. The only mines swept in the whole Tinian Area were 17 in Asiga Bay off the Yellow Beaches, and these were not swept until after the assault landing. Day time UDT reconnaissance of the beaches off Tinian Town was also carried out on Jig Day minus one. And, more importantly, a logistic support plan was developed which it was hoped would move all the essentials across the narrow White beaches on wheels or tractors directly to the divisional dumps. This was to prevent any large amount of logistic support piling up on the beach during a rehandling operation. Everything that could be was pre-loaded onto the DUKWs or tractors which would carry it direct to the divisional dump. every worthwhile target that air reconnaissance could discover within their range, which was about seven and a half miles. This was roughly the northern half of Tinian since Tinian lay from three to three and a half miles south of Saipan. Air and naval gun bombardment had responsibility for the southern half plus any guns located in the cliffs of Tinian. The Japanese on Tinian were as secretive as their comrades on Guam, and reluctant to engage in shooting matches. Consequently, as late as Jig Day, well camouflaged large Japanese guns were being discovered in addition to small machine guns. Besides the 20-millimeter gun shooting at LSTs, the larger ships were not immune from Japanese guns with greater weight of shell. It certainly was an unusual sight to see those two tiny groups of 8 LVT and 16 LVT abreast take off from the Line of Departure for beaches White One and White Two respectively. Never had such an insignificant First Wave started a major offensive operation. . . . The assault landing went remarkably well. A tactical surprise had been obtained and held for some hours, because the demonstration landing off Tinian Town by the transports and related craft and the heavy air and gun bombardment of the Tinian Town area convinced the Japanese command that the main landing would turn out to be there. Consequently, one of the three battalions of the 50th Infantry Regiment was held in defensive position at Tinian Town all through Jig Day. Seven of the fourteen large transports and cargo ships still in Saipan waters, with the Second Marine Division embarked, carried out this useful demonstration off Tinian Town early on Jig Day. Following this demonstration, the Second Division was assault landed on the White beaches as soon as the Fourth Division had climbed through the narrow exits back of the beaches. The 27th Infantry Division was held on Saipan in Landing Force Reserve but prepared to embark on four hours' notice, to land on Tinian. By almost superhuman efforts the amphibians had landed the entire Fourth Division and one battalion of the Second Division by dark, including 48 tanks, the 77-millimeter pack howitzers, their many bulldozers, cherry picker cranes, and much hot cargo. A goodly share of the 15 dead from the first day's spirited assault were personnel in the two amtracs blown up by mines on White Beach Two. Once a counterattack led by heavy tanks about 0300 on Jig Day plus one had been broken up and turned back in full retreat (although breaching our outer lines initially), the worst of the battle for Tinian was over. Fortunately, the quick overrunning of the airfield permitted cargo planes to provide emergency logistic support by shuttle planes. Heavy swells and accompanying high winds have prevented all unloading except by DUKWs and LVTs. If unsatisfactory sea conditions persist, plans have been made to launch emergency supplies by air. The amphibians had had a few bad moments before this happened, and these had been primarily because of weather. The LST-340, despite the fact that the Commanding Officer "acted in a cool and seamanlike manner,"65 broached and was lost as an operating ship. Numerous LCVP were lost and larger landing craft damaged. Left to right: Major General Harry Schmidt, USMC; Admiral Raymond Spruance, USN; Vice Admiral Kelly Turner, USN; Lieutenant General Holland M. Smith, USMC; Major General Clifton B. Cates, USMC; and Captain F.S. Withington, USN, gather for Tinian flag raising ceremonies, August 1944. 38 LSTs unloaded in 3 days at Tinian an amount that took over 8 days at Saipan. The excellence of the logistic support rendered at Tinian, despite the handkerchief beaches and the scanty exits, was the most marked characteristic of the Tinian assault. Some idea of the magnitude of the FORAGER logistic problem can be obtained from CINCPAC's order to Commander Service Force Pacific to have 21 Fleet oilers available to support that part of the Pacific Fleet participating in FORAGER. These oilers had to be prepared to deliver to these ships 158,800,000 gallons of fuel oil during each two-week period commencing 1 June 1944. The logistics problem was eased by the availability for the first time of Fleet repair facilities at Majuro, Kwajalein, and Eniwetok in the Central Pacific, as well as at Seadler Harbor, Manus Island in the Southwest Pacific Area. Six hospital ships were available in the Central Pacific to take care of the wounded and the sick, as well as mobile and base hospitals having over 10,000 beds in the South Pacific Area. But many in the Japanese Navy except for Commander Chikataka Nakajima, Intelligence Officer on the Staff of the Combined Fleet, thought our amphibious assault was headed for the Palau Islands or the islands between New Guinea and the Philippines. The FORAGER Operation was the largest amphibious operation of the Pacific War up to June 1944. It was not the longest--since Guadalcanal had lasted from 8 August 1942 through 8 February 1943--but it had even more strategic significance than Guadalcanal. When we took Guadalcanal, we broke through the Japanese outer line of defense. When we took the Marianas, we broke through the Japanese inner line of defense. the Pacific. He was far from alone in that military judgment, although the public has been told far more frequently that Midway marked that important corner. It is believed that after Midway the United States Navy turned from defensive operations to offensive operations. After Guadalcanal, the Japanese Navy turned from offensive operations to defensive operations, but after the Marianas all of the Japanese military largely resigned themselves to eventual defeat. The Marianas was a major turning point in that important respect. The Japanese, like the United States Navy, realized that the Mariana Islands were the key to the Pacific War. . . .
No one who participated in the GALVANIC Operation will forget Thanksgiving night, 1943 when the Admiral outwitted and outguessed 8 Jap planes attempting to attack our formation. CINCPOA's Air Officer, Colonel Eareckson, termed it 'the most magnificent maneuvering' he had ever seen. Few guessed on that day of 24 August 1944, that a year later they would be in Tokyo. 1. (a) Edmund G. Love,The 27th Infantry Division in World War II (Washington: Infantry Journal Press, 1949); (b) Love, "Smith versus Smith," Infantry Journal, LXIII (November 1948), pp. 3-13; (c) Robert Sherrod, "An Answer and Rebuttal to 'Smith versus Smith,' The Saipan Controversy," Infantry Journal, LXIV (January 1969), pp. 14-28; (d) Holland M. Smith and Percy Finch, "My Troubles with The Army on Saipan," Saturday Evening Post, VII (13 November 1948), pp. 32-33, 65-66, 68, 73, 74, 76, 77, 78, 80, 82. 3. COMFIFTHFLT 240100 Jun. 1944. 4. Turner. See Crowl, Campaign in the Marianas (Army), Chs. IX and X generally and page 193 in particular. 5. CTF 51 080924 Jul. 1944 appears in the Endorsement to Encl. (D) Commanding General, 27th Infantry Division to Commanding General USAFPOA, letter, 12 Oct. 1944. 6. Headquarters Army Forces Central Pacific Area to Commander in Chief, U.S. Pacific Fleet and Pacific Ocean Areas, Pearl Harbor, T.H. (For Eyes of Admiral Nimitz Alone) in memorandum of 27 Dec. 1943, sub: Fifth Amphibious Corps. 7. (a) CTF 51 to COMFIFTHFLT, Ser 00640, 16 Jul. 1944; (b) COMFIFTHFLT to CINCPAC, letter, Ser 00414 of 18 Jul. 1944. 8. (a) Nimitz; (b) Love, p. 22. 10. Turner, Presentation at the Navy General Line School, 5 Dec. 1949. 11. (a) COMFIFTHFLT to CINCPOA, 030601, 051425 Jul. 1944; (b) CINCPOA to COMFIFTHFLT, 032109, 060236 Jul. 1944. 12. Brigadier General O.T. Pfeiffer, USMC, Plans Division Staff, Memo for Admiral King, 23 Jun. 1944. 13. LST-227 War Diary, 12 Jun. 1944. 14. COMFIFTHPHIBFOR GRP Three (CTF 53) Op Plan A162-44, 17 May 1944, Annex A, p. 2. 15. CTF 51 to COMFIFTHFLT, 11306 Jul. 1944. 16. COMLSTGRP 38, Report of Tractor Group Four in Guam Operations, 1 Sep. 1944, p. 4. 17. Ibid., pp. 3, 4. 18. LST-227 War Diary, 15 and 18 Jun. 1944. 19. CTG 53.5 FORAGER Report, Part V, p. 12. 20. CTF 56 FORAGER Report, Encl. (D), G-2 Report, p. 17. 21. Commander UDT Three Action Report, 18 Aug. 1941. 22. (a) COMTRANSDIV Eight, Comments, Observations, and Recommendations--Guam Operation, 20 Aug. 1944; (b) COMLSTGRP 38, Report of Tractor Group Four, 1 Sep. 1944. 23. CTG 53.19, Action Report, 7 Aug. 1944, pp. 23-24. 24. Ibid., pp. 25, 27. 25. CTG 53.2 Commander Southern Attack Group, Agat, Guam, Action Report, 20 Aug. 1944, p. 7. 26. LST-227 War Diary, 24 and 26 Jul. 1944. 27. LST-267 War Diary, 25 Jul. 1944. 28. CTG 53.2 Action Report, 29 Aug. 1944. 29. LST-227 War Diary, 23 Jul. 1944. 30. CINCPAC-CINCPOA, Monthly Operations Report, July 44, p. 37. 31. COMPHIBFOR FORAGER Report, Annex 4 to Encl. (B), p. 2. 32. COMTHIRDPHIBCORPS to CTF 53, 101413 Aug. 1944. 33. RKT to CWN, letter, 5 Jul. 1944, Enclosure, p. 2. 34. RKT to Commodore W.B. Phillips, Commander Administrative Command Amphibious Forces, Pacific, letter, 1 Aug. 1944, para. 8. 35. COMLSTGRP 38, Report of Tractor Group Four, 1 Sep. 1944, p. 10. 36. Compiled from CTF 51, CTF 52, CTF 53, CTG 52.2, Reports of Guam Operations. 37. CTF 53, FORAGER Report, p. 15. 38. Hill Memo of 17 Nov. 1966. Hereafter Hill Memo. 39. COMPHIBSPAC (CTF 51) FORAGER Report, Encl. (A), p. 19. 40. COMFIFTHPHIBFOR War Diary, 23 Jul. 1944. 41. RKT to Commandant, Marine Corps, letter, 6 Nov. 1950, p. 8. 42. CTF 56 FORAGER Report, 25 Jul. 1944, Vol. 7, Encl. (G-2). 43. COMPHIBSPACGRP Two (CTF 52) Attack Order A112-44, Annex G, p. G-5, G-4. 44. Vice Admiral Hill to Commandant Marine Corps, letter, 16 Jan. 1951. 45. Hill Memo, 17 Nov. 1966. 47. CGFIFTHPHIBCORPS FORAGER Report, Vol. I, 12 Aug. 1944, Encl. (L), Report of Amphibious Reconnaissance Battalion, 11 Jul. 1944. 49. Hogaboom Interview, 15 May 1967. 50. Forrestel, Spruance, p. 152. 51. RKT to Commandant, Marine Corps, letter, 21 Dec. 1950. 52. Interview with Admiral Hill, March 11, 1967. 53. COMPHIBSPAC (CTF 51) Letter of Instruction A21-44, 12 Jul. 1944. 54. CTF 52 (COMPHIBSPACGRP Two), Report of Capture of Tinian, 24 Aug. 1944, p. 6. 56. LCI(G)-458 Action Report, 28 Oct. 1944, p. 1. 57. LCI(G)-78 Action Report, no date. Action: 15 Jun.-24 Jul. 1944. p. 3. 58. LCI Group Seven War Diary, 24 Jul. 1944. 59. COMFIFTHPHIBFOR War Diary, 3 Aug. 1944. 60. COMLSTGRP 39 Marianas Operation Report, 3 Aug. 1944, pp. 5-6. 61. COMFIFTHPHIBFOR War Diary, 24 July 1944. See also Colorado to CINCPAC 240800, 260517 July 1944. Final figures were 39 dead, 109 wounded. 63. COMPHIBSPACGRP Two War Diary, 29 Jul. 1944. 64. CTF 52 to CTF 51, 231401 Jul. 1944. 65. Endorsement of CTF 51 in LST-340 Grounding Report, 31 Jul. 1944. 66. COMLSTGRP 39 Action Report, 3 Aug. 1944, pp. 6-7. 68. COMGENFIFTHPHIBCORPS FORAGER Report, Vol. 4, 12 Aug. 1944, Encl. (F), pp. 4-5. 69. COMTRANSGRP Able, Operation Report of Saipan, p. 34. 70. CTF 51 War Diary, 10 Aug. 1944. 71. (a) Hoffman, Saipan (Marine Corps Monograph), p. 124; (b) Love, Marianas (Army), p. 303. 72. COMFIFTHFLT, 080100 Aug. 1944. 73. CTF 56 FORAGER Report, para. 6, p. 10. 74. CINCPAC-CINCPOA, Monthly Operations report, June, 1944, Annex A. p. 99. 75. CTG 52.2 Saipan Report, 23 Aug. 1944, p. 69. 76. Ito, The End of the Imperial Japanese Navy, p. 80. 77. CINCPAC Command Summary, Book Five, 4 Jun. 1944, p. 1945. 78. RKT to Commandant of the Marine Corps, letter, 21 Dec. 1950. 79. USSBS Interrogation No. 366, Vol. II, p. 293. 80. Smith, Coral and Brass, p. 181. 81. King's Record, pp. 557, 560. 82. Rocky Mount Press News Special Edition, 24 Aug. 1944.